Not everyone has a partner, or is going to spend Valentine's Day with their partner. 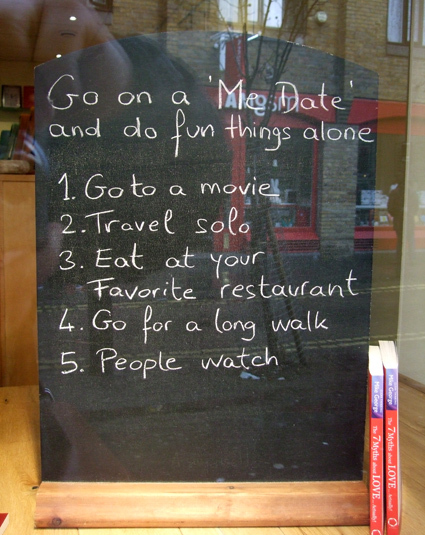 If you are on your own by choice or necessity today, the board I photographed in the window of the shop Inner Space has some good advice for things to do alone on a Me Date. Inner Space is dedicated to meditation and personal development. It is right next door to New Age shop Mysteries, which has just moved to a new location at 34 Short's Gardens, Covent Garden, London WC2H 9PX. I took the photo when I was walking past Mysteries just over a week ago, on my way to run one of my scrying by candlelight workshops at nearby occult bookshop Atlantis. I had hoped to get a photo of the new venue to put on my blog, but at that time Mysteries was still closed and setting up. It is open now, I understand, and I hope to visit soon and blog about it. However, my detour wasn't wasted, as my photo shows, and Inner Space a lovely shop too.